As explained by Google, these search query autocompletes are predictions rather than suggestions. They are Google’s best predictions of the query you were likely to continue entering based on real searches that happen on Google. So, when does Lysol cle autocompletes to does Lysol clean the air that’s because enough real searches have been done on the subject to predict that’s the information most people are looking for. Which, in this instance, is an indication of the general lack of knowledge when it comes to cleaning the air. Yes, the air can be cleaned, but misconceptions and misinformation about how it can be cleaned abound. The following addresses the various ways that air can be cleaned to eliminate infectious pathogens and odors, the ways people believe it can be cleaned, and what pet care providers should consider to not only protect the health of the pets in your care, but you and your staff’s health, as well. Surface cleaners and air fresheners cannot clean the air. If you read the usage instructions for Lysol “disinfectant” sprays, for example, they specifically direct you to apply the product to surfaces. Cold and flu viruses and bacteria can be killed on “hard, non-porous surfaces.” And, while the directions for different products vary, most of the usage information directs that surfaces must remain wet for a minimum period of time then allowed to air dry. Lysol’s line of “sanitizing” sprays do, however, promise to “temporarily reduce airborne odor-causing bacteria and eliminate odors.” To do so, the usage information instructs to “close all doors, windows, and air vents…Hold can upright, press button, and spray towards the center of an average size room (12′ x 12′ x 9′) for 10 seconds…For maximum effectiveness, relative humidity should be between 45% and 70%…Resume normal room ventilation after spray has settled.” Two things should be noted here. First, there are no claims that airborne infectious pathogens (dog flu, canine cough, etc.) can be eliminated, an imperative for pet care facilities. Secondly, particularly with regard to the “sanitizing” sprays, not only is the area that can be sanitized notably limited, the results temporary, and conditions for maximum effectiveness fairly specific, but what, exactly, is being sprayed into the air you and the animals breathe? Further, most of the sprays are synthetically fragranced. In the Q1 2018 issue of Pet Care Pro Quarterly the negative impact of chemical fragrances was addressed in depth in, “Fragrance” Stinks: The Health Risks of Chemically Scented Products for Pets and People. One category of products addressed as causing unhealthy indoor air pollution was air freshener sprays. Even products that are labeled “unscented” utilize masking agents that are fragrances added to mask other smells. Not only do surface cleaners and air fresheners not clean the air, they may be causing worse air quality for animals and humans. Similar conditions occur in animals exposed to even low levels of ozone. Further, studies show that air purifiers that generate ozone deemed within “safe” limits established by government regulations, do not necessarily mean safe for animals. The dangers in ozone for humans and animals, whether intentionally produced or as a byproduct, cannot be overstated. Nevertheless, air ionizers are widely available, they even come in desk sizes to “purify” the air around you at the office. 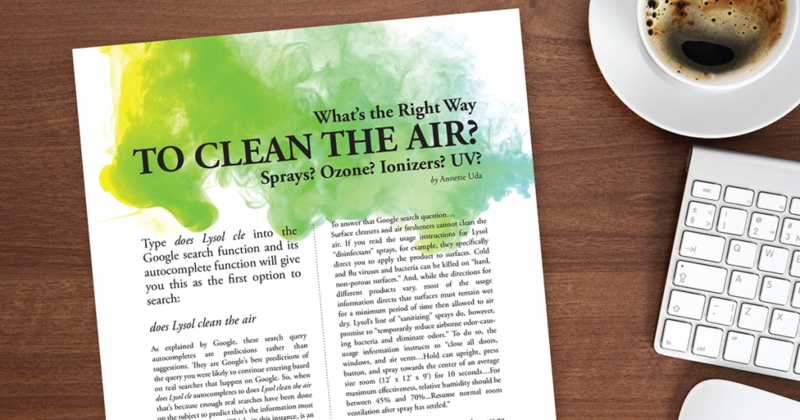 But given their propensity to create ozone (the dangers of which are addressed, above), failure to effectively kill pathogens and have those pathogens indiscriminately land on surfaces and return to the air if they’re not immediately eliminated, air ionizers are not a recommended way to clean the air. Ultraviolet germicidal irradiation is a disinfection method that has uses short-wavelength ultraviolet (UV-C) light to kill or inactivate microorganisms by destroying nucleic acids and disrupting their DNA, rendering them harmless. Ultraviolet germicidal irradiation or UVGI is a term used by federal agencies such the Centers for Disease Control (CDC) when referring to UV-C. It is also more informally, and perhaps more commonly known, as “UV” but it is not the same as the “harmful UV rays” you may have heard about to prevent sunburn, for example. UVGI has been used in human healthcare settings for close to a century to prevent the spread of infectious disease. UVGI is used in government buildings, hospitals, and other highly sensitive environments where maintaining sanitary air circulation and surface areas are critical. This is not the same as UV-A, which can cause premature aging, or UV-B, which can cause skin cancer. UVGI is often just called UV but it is not the same. To understand how UVGI works, think of cleaning the air somewhat like cooling the air. Very simply put, air conditioners work by cooling air as it passes through them. Hot air goes in, cold air comes out. You can clean the air by sanitizing it as it passes through something that will kill the bacteria and viruses. That something is ultraviolet germicidal irradiation. As the air circulates through UVGI lamps, viruses, bacteria, and pathogens in the air are killed leaving clean, sanitized air to circulate out. The science behind how it works is simple enough to grasp but, when it comes to UVGI technology effectiveness, there are several big “buts” to keep in mind. It must be the right UVGI. “Over the counter” UVGI light is not strong enough and cannot achieve a high enough bacteria and virus kill rate in the short amount of time that is needed to be effective. It must the right amount of UVGI energy for the space. Every building, every space, has different, custom requirements. It must not produce ozone. Some UV systems do, unfortunately. When it comes to UVGI or any other air cleaning methods you are considering, asking questions and getting answers is imperative. Ask for studies that prove effectiveness. More importantly, ask for the manufacturer’s studies. Not someone else’s studies or general studies. What do studies of their specific products show? Talk to experts. Ask for references. Understand the benefits and the risks. Few things are more important than the air animals and humans breathe. Make sure your efforts to clean the air are not only actually effective, but also that those efforts are not potentially making the air worse. Annette Uda is the founder of PetAirapy, the animal care industry’s leading manufacturer of UVGI surface and air sanitation equipment. Annette has a passion for animal health and educating animal care providers on reliable, non-toxic ways to create clean, healthy environments for your animal clients and your staff that are protected from airborne pathogens, infectious disease, and noxious VOCs. PetAirapy also recently launched FreshAirapy, its natural, non-toxic line of products for targeted, immediate odor control specifically for the animal care industry. To learn more about her company, visit petairapy.com.